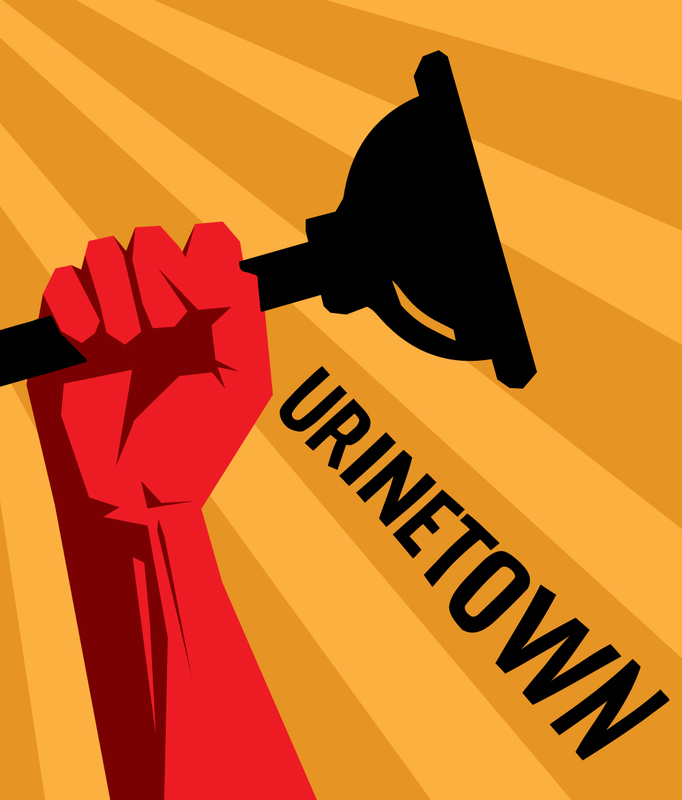 College of Charleston Theatre and Dance closes its 2018-2019 season with the hilarious, Tony Award-winning comedy Urinetown directed by artist-in-residence Bret Shuford with musical direction by Laura Turner. While the show is lighthearted in nature, it shares with audiences a glimpse of serious issues tied to the season’s theme of social justice in support of the College’s sustainability literacy initiative. A 20-year drought has caused a water shortage and has led to a government-enforced ban on private toilets. Citizens must use public amenities, regulated by a single malevolent company that profits by charging admission. A hero decides that he has had enough, and plans a revolution. Winner of three Tony Awards, three Outer Critics Circle Awards and two Obie Awards, Urinetown by Mark Hollmann and Greg Kotis is a satire on capitalism, populism, bureaucracy, corporate mismanagement, politics, greed and the musical theater! The show will run April 11-16, 2019 in the Emmett Robinson Theatre, Simons Center for the Arts, 54 Saint Phillip St. A talkback with actors will take place after the opening night performance. TICKETS CAN BE PURSHASED ONLINE, by calling (843) 953 -6306, by emailing, or at the door two hours prior to curtain. Admission is $20 general; $12 College of Charleston students; $15 College of Charleston employees, Senior Citizens, non-College of Charleston students. Director and choreographer Bret Shuford is spending the 2018-2019 academic year working directly with students in the College’s Department of Theatre and Dance, which is being funded by the Quattlebaum Artists-in-Residence Endowment. Last fall, Shuford conducted lectures, workshops and masterclasses on various acting and arts management skills. This semester, in addition to directing Urinetown, Shuford will give a free presentation titled “Business of Broadway” on April 18 at 5:00 p.m. in the Emmett Robinson Theatre. With its origin dating back to 1985, the College’s Quattlebaum Artists-in-Residence Endowment has helped connect students and the community to renowned artists, such as visual artist Christo, pianist Leon Fleisher, photographer Duane Michaels, former NEA Chairman and actor Jane Alexander, and visual artist Htein Lin, among many others. Shuford’s Broadway credits include Cirque Du Soleil’s Paramour, Amazing Grace, Chitty Chitty Bang Bang, Beauty and the Beast, and The Little Mermaid. Other N.Y. credits include Actors Fund Benefit performances of A Wonderful Life, Best Little Whorehouse in Texas, On the Twentieth Century, and the Radio City Christmas Spectacular. Shuford’s credits outside of New York City include the National Tour of Lincoln Center’s South Pacific and Dr. Fine/Dr. Madden in Next to Normal at the Adirondack Theatre Festival. He originated the role of Vernon Castle in Castlewalk, a new musical presented as part of the New York Music Theatre Festival. He has sung with the Indianapolis Symphony Orchestra, Pittsburgh Symphony, Baltimore Symphony, and the Fort Worth Symphony. Shuford also has been seen on TV and Web series including Law and Order SVU, Alpha House, Submissions Only and My Dirty Little Secret. His film credits include Scorsese’s The Wolf of Wall Street, Bedfellows, and Uncle Melvin’s Apartment. Music Director Laura Manning Turner received her B.F.A. in Dramatic Writing and an M.F.A. in composition for Music Theater concurrently from New York University. Since 1994 she has been Associate Professor of Theatre at the College of Charleston where she began the Theatre for Youth program and the M.A.T. in the Performing Arts Program which prepares theatre and music teachers for the K-12 school setting. She also teaches musical theatre coursework in the department. She is a playwright and composer of many musicals for family audiences in collaboration with her husband. Some of their original works include: MarsQuest, awarded grants by N.A.S.A. ; The Redcoats and Glow: The Story of Marie Curie, commissioned by The Charleston Museum; The Wizard of Wartville, sponsored by Keep America Beautiful; and WorldSong, which won a national playwriting competition and toured the Midwest. In addition, her musical, Finding Joy, was published by Eldridge Publishing Company with performances in churches nationally each year. Her musical score for A Boy and His Piano was published by Dramatic Publishing Company after premiering with Charleston Stage Company. She also was a finalist for the national Aurand Harris Playwriting Fellowship sponsored by the Children’s Theatre Foundation of America.